As a kid going out to pizza was a big deal in my house. Usually the luxury was bestowed upon us by my grandma. She treated us when we were at her house and she did not want to cook, or when we begged her for pizza. I was more a fan of thick crust pizza, but when my sister, grandma, and I were together, they usually beat my choice which meant we had Pizza King. Known for their thin crust Pizza (and locations only in Indiana), it was the default quick and easy meal, and a luxury to us kids. The pizza was fine to me (although I have craved it in the past few years) but my favorites were the breadsticks, and if I was very lucky the massive chocolate chip cookie. It was the size of an 8 or 10 inch pizza. Since Chris loves cookies of most kinds (sans snickerdoodles and sugar cookies) I am always on the lookout for a new cookie recipe. 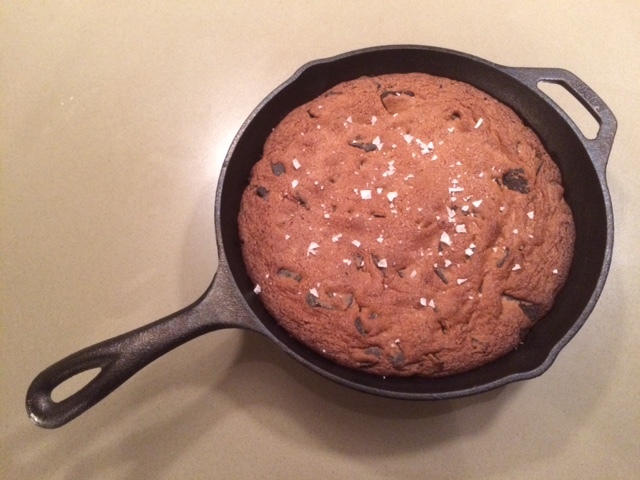 This one was a bit different as it is one big cookie in a skillet (just like my childhood Pizza King cookie, only much thicker). Preheat the oven to 375 degrees. In a bowl whisk together flour and baking soda, and set aside. In a standing mixer fitted with a paddle attachment, beat butter and sugar on medium speed until well combined, about 3 minutes. Scrape down the sides of the bowl, add the egg, salt, and vanilla extract, and continue beating until combined. Add flour-soda combo mix until just incorporated. Using a spatula, fold in chocolate wafers. 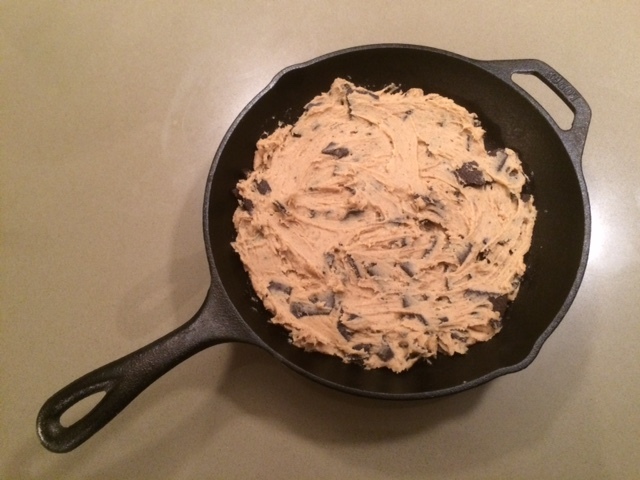 Flatten the dough inside a 10-inch skillet. Bake for around 30 minutes, or until the center is just set. To simulate Ned Ludd’s blackened, bitter crust, turn the broiler on and cook a minute or two longer, taking care not to burn the top completely. Remove from oven and sprinkle with flake salt. Serve with a small glass of milk, or pour milk right over the top while the cookie’s still hot and watch it sizzle. It is delicious. If you like a crispy thin cookie this will not be your thing, but if you like a crispy outside and soft, almost cake-like inside this just might hit the spot. We ate it for a few days, and I have to say that warming it and pouring the milk, half and half, or heavy cream on top is a must. There is something about the cookie with the flake salt, and the cold cream mixture that makes a mouthful of flavors.